Make it easier for yourself! 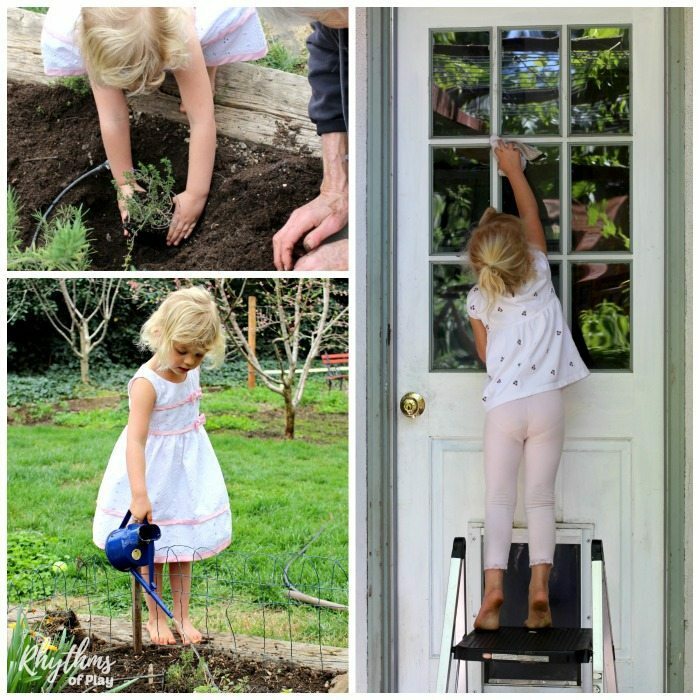 Learn how to raise an internally motivated child that will help you with household chores, gardening, and yard work with these 15 ways to raise a helper. Young children love to feel useful and want to help around the house. Allowing them to help, even when it makes it harder for us, encourages this aspect of their nature. When we discourage them from helping, we eliminate this natural tendency. 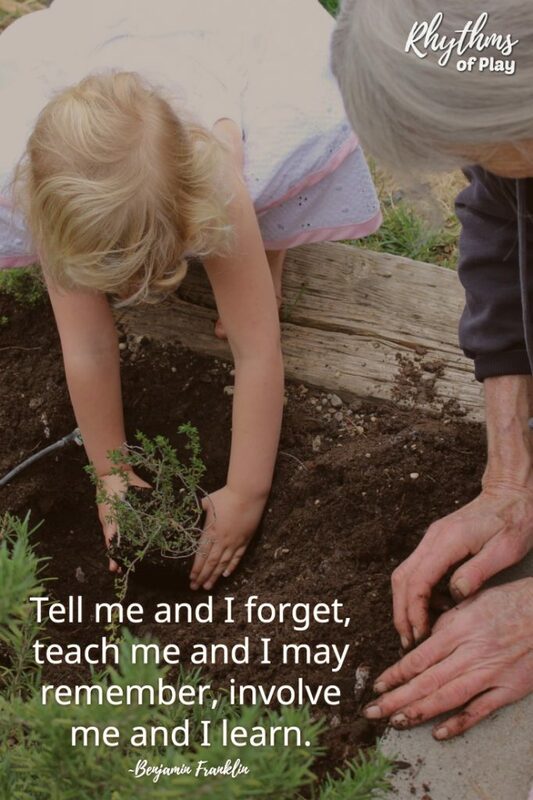 When we allow our children to help us from the beginning it becomes a part of who they are. They identify with their role as a helper around the house. They see us working and they want to be like us. Why not capitalize on this natural tendency? 1. Position your child so they can watch you work from the time they are infants. Children learn everything by watching the people around them from the time they are born. This is why it is super important to work when they can see it. I know, I know… it’s soooo much easier to work when they are sleeping or gone. Yup… I totally get it. Would it help if I told you that I felt the same way and often avoided work when my daughter was young? One of my biggest mistakes. Children need to see you work around the house or they will not know what is expected of them in the future. It may seem trivial, but I assure you it’s not. I realized how well this worked both when I worked as a nanny, and when I ran a childcare in my home. I always needed to do chores in front of the children. Over time I learned that this was a very good thing! Don’t worry if you haven’t done this yet… start now! Show your children how you want things to be done. Children learn best when they are shown, not lectured. In Montessori and Waldorf education all work is demonstrated to a child before they are asked to complete a task. This is because children are imitative creatures. That’s a fancy way of saying that they learn best by watching others. 3. Complete the action EXACTLY as you would like it to be done. I mentioned that children are imitative creatures right? When you demonstrate how work is to be done, whether you think they are watching or not, do it EXACTLY as you would like it to be done. Like it or not, your children will show you how good your example was… or wasn’t. They don’t know how you meant to do it, or how you wanted to do it. They only know what they saw. My daughter has taught me on many occasions that I need to improve my example, and sometimes she shows me that I’ve been doing a pretty good job. For the whole story see How to Raise a Helper. 4. Allow your child to start helping when they start walking. As soon as a child can move around on their own they can help. Trust me… it’s all they want to do. Your children want to do what you do. They have been watching you their whole life and they can’t wait to get started! When you allow children to help from the very beginning it becomes a part of who they are. Helping becomes a habit. It becomes their norm… their way of life. Find simple tasks they can do to help and allow them to imitate you in whatever way they can. This is how learning happens and how you raise a helper! Whatever you do, don’t discourage an eager worker. It doesn’t take long to teach a child that you don’t want them to help. If you’re reading this I’m pretty sure that’s not what you want. I’ll be honest. Working with your child when they are young can be tough. It can be downright painful at times. I can’t tell you how many times I’ve wanted to get my daughter out of the way so I could get things done. Of course, there will be times that we cannot include our children. Do your best to handle it gracefully. Simply invite and allow your child to help. If your child is not interested… no problem. No pushing, forcing, or shaming. If children don’t want to help, let them come and go as they please. They will eventually find something to do on their own. This is a win, win, win situation. Your children will learn from watching, helping, or figure out how to entertain themselves. You’ve got nothing to lose! Whatever you do don’t stop working because they don’t want to help. Don’t ignore them for hours and hours while you work either. Find the balance and you can’t go wrong. What we say and how we say it matters. Our children want to please us. Watch your language while they are helping and be careful not to bruise their self-esteem with harsh words. Help children learn to help you by offering your support when needed, but please don’t do it for them. 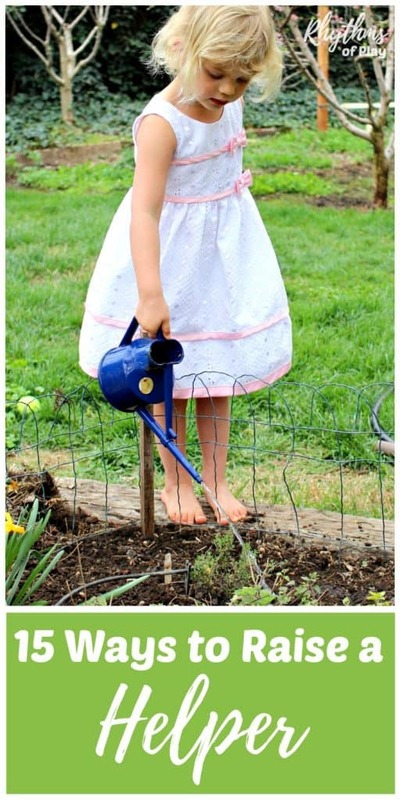 My daughter helping grandma plant thyme in the garden. When you do things for your child you teach them that you do it better than they can. Your child will continue to let you do everything for them when you teach this. Why should they bother when you are better at it? Each time you do something for a child that they can do for themselves, you limit your child and increase your workload. Allow children to gain mastery by figuring things out on their own. Of course, there will be times that you will need to do things for them. I know I have. We do what we can, right? This one has more to do with our example than with our words. We need to show our children how to admit it when we’ve made a mistake, learn from our mistakes, accept our faults, and move on… even when we get upset. We do this every single day. Our children are watching our every move and mirroring back what they learn. Everyone makes mistakes, and sometimes we get angry about them. We are human after all. How we recover from our mistakes is what makes the difference in the eyes of our children. Especially when it’s directed at them. Usually, children are more upset with themselves than you are when they make a mistake. They are also afraid that you will be angry. Please don’t make it worse for them or scare away your helper. When children are praised for their effort, they are more likely to blame mistakes on a lack of effort as opposed to a lack of ability. When children are praised for their ability, they are more likely to feel like a failure and lose the motivation to help when mistakes are made. Please don’t re-do or “fix” what your child did in front of them. This will make them feel unworthy and that their work was not valued. Children (and adults) that don’t feel “good enough” are much less likely to help. For example, if your child is helping you fold laundry and you don’t like how it was done please wait until they are long gone to re-fold it. Praise their effort in the moment and do what you need to do later. Think of practical life activities like home economics for little ones. They are designed to provide real-life experiences for children to help them learn and develop independence. Dr. Montessori created what she called “Practical Life Exercises” to teach children how to complete activities done in daily life. She believed that these activities would help children become independent members of the household. In Waldorf education, these activities are called Home Life Activities. You don’t have to know anything about Montessori or Waldorf to offer these types of activities to your child. A few options are listed below. Children thrive on rhythm in the home. Having regular daily, weekly and household rhythms help children learn what to expect day by day, month by month. For example, children are more likely to help out around the house when they know what’s coming. Especially if they have their own tools. If dusting day is Wednesday morning in your home your kids will know what to expect and be more likely to help–or hide. Either way, your good to go. You will have eager helpers or an easy time getting it done on your own. Having a regular rhythm is also good for self-care. Motherhood is tough. We can not truly care for another if we are not caring for ourselves. Put you-time on the weekly schedule. The kids will learn when it’s your time and you are not to be bothered. To learn how to use the power of rhythm to get organized for good click on the link. If you really want kids to help, give them their own tools. Tools are magical objects to children. They see us using them and they want to use them too. When you give a child a tool it is as if you are saying, “you are good enough to help, you are valued, and you are worthy.” That is EXACTLY what they need and want to hear. One of my daughters’ favorite tools is her cleaning kit. Check out Tools for Raising Helpers for more information. My daughter using her cleaning kit on our DIY outdoor art table & mud kitchen. Raising an internally motivated child is important to your child’s education. Home life is one of the developmental domains of childhood along with language (reading & writing), math, science, art, music, gross motor, fine motor, sensory, and social-emotional learning. The primary lesson of home life is learning to help around the house and learning to be independent. I don’t know a single parent out there that doesn’t want to have a helpful, internally motivated, independent child. Help them help you… to help them, become the helper they were born to be! Don’t forget to pop over to read How to Raise a Helper and Tools for Raising Helpers.